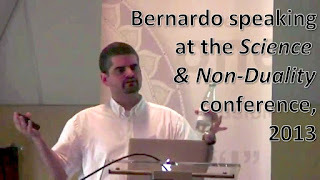 Bernardo presenting at Science and Non-Duality Europe 2013. 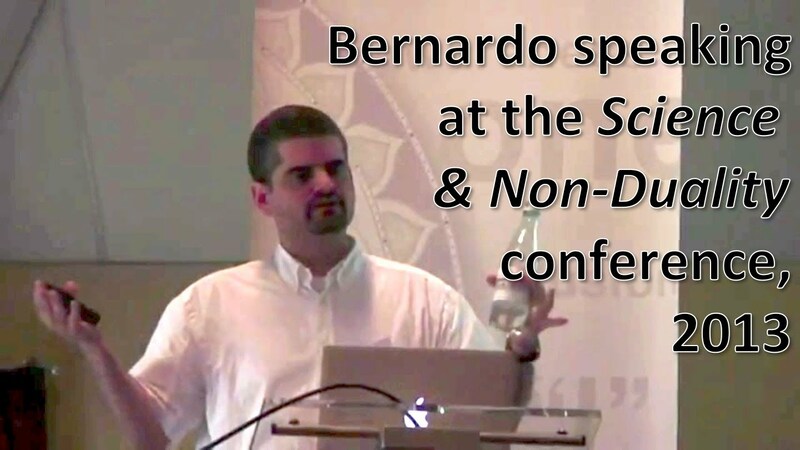 Here is a video of my recent presentation at the 'Science & Non-Duality' conference 2013, where I discuss parts of my upcoming book 'Why Materialism is Baloney.' The presentation was very well received there, so I hope you enjoy it too. I left a comment on this post, I assume you receive it but did not post. I can't believe that you will censor an innocuous comment. Hi. I don't censure anything a priori, since the system does not wait for me to approve comments. And even after that, I ever only removed one comment from this blog. I looked for your comment inn the spam box, but it isn't there either. Sometimes blogger makes it difficult to sign in to post a comment. I recommend writing the comment first, on a text editor, and then pasting it. If it doesn't work, you can always try again without having to re-type. Cheers, B. A brilliant exposition, Bernardo: it makes your take on Idealism much clearer in my mind. I hadn't quite realised before that you aren't really speaking about spirituality, so much as that apprehension of reality that might best *explain* reality. I agree, it's absurdly simple, and eliminates a great deal in terms of Ockham's unnecessary multiplication of entities. I can't wait for your book to come out: do you plan to have a Kindle version? I hope so, as I can tailor the text size to suit my old eyes. It looks like there are some more videos from the science and non-duality conference on YouTube, and I'll definitely be checking those out. To the person above, I have noticed in the past that my comments can take a little time to appear. Bernardo doesn't censor reasonable comments. It may be that your original posting was put in some kind of holding or spam folder if it unwittingly contained a selected word or phrase. Thanks Michael! On the question of spirituality, the definition of the word is sometimes tricky. In general, yes, I don't think I am discussing 'spirituality' because I am talking about everyday reality. But a necessary implication of my position is that consciousness never disappears (not even at death), so it rubs on spirituality, I guess. Excellent presentation! I love your case that brain-reduction often equals mind expansion. I find that very compelling. I haven't heard anyone else make that case with the breadth that you do. It's one of those things that should make headlines. I like your metaphors, such as the whirlpool metaphor, and feel in basic agreement with them. However, I keep having a nagging discomfort in the back of my mind. Let me see if I can put it into words. I think my issue is that the model seems strong on what I would call downward causation--from mental to physical; mind is limiting itself and the image of that is the brain. What I have a harder time fitting into your model is the "upward causation" (physical to mental) that certainly seems true on the level of appearance. I also wonder about horizontal interaction between (apparently) different minds. So my question is this: would it be possible to, while still retaining the seniority of the pure downward causation of the whirlpool metaphor, combine it with a kind of quasi-dualistic view? In this view, the brain is the "image" you speak of, but for practical purposes also behaves as a semi-independent object, which filters the mind, which the mind "operates" (like one does a car), and which in turn acts on the mind. The mind comes into association with this filter at birth, can leave it for brief periods during life, and leaves it permanently at death. While associated with it, the mind perceives its environment through its mediation, something which does profoundly filter, alter, and even distort the mind's acquaintance with whatever is out there. This sounds dualistic, but what makes it merely quasi-dualistic is that the brain and all other physical objects are, in this view, not a different substance called matter, but are just more permutations of mind. They are ultimately just images held (collectively) within mind, and therefore not a different "stuff" at all. When I hear or read your metaphors of brain being the image of mind limiting itself, I keep wanting to also hear this other view folded in. And I wonder if you are actually excluding it or merely silent about it at the moment. I am sure you have considered all this and I thought I'd ask what your conclusions are at this time. "So my question is this: would it be possible to, while still retaining the seniority of the pure downward causation of the whirlpool metaphor, combine it with a kind of quasi-dualistic view?" Strictly speaking, there isn't downward or upward causation in my view, since everything is mind. So when mind localizes, that localization looks like a brain. When a surgeon takes a scalpel to a brain, that is just the image of mind interfering with mind: the surgeon is the image of a mental process, and so are the scalpel and the brain. There is no 'physical world outside of mind' that interferes with mind. It's all the unfolding of mind, which looks to us like what we call reality. Do you see what I mean? All this said, I find it fair to make dualist metaphors. But it's also tricky. It's easy to fall back into seeing the brain as something outside mind (or a surgeon, or a scalpel), and then the metaphor may lead to erroneous conclusions. OK, you caught me. I had allowed myself to get drawn off by other reading. But I've now gotten back to the book and am nearing the finish! Bernardo, I've read more now (almost finished) and understand much better where you are coming from. I have a question for you if you are still viewing comments on this post. If we view the body/brain as a mental image (like a dream image) held COLLECTIVELY in mind, we get a "body" that has a degree of independent existence from the individual mind associated with it (due to it being a collectively held image). This allows for a genuine interaction between mind and body, which allows for many things, including ghosts, as well as OBEs that would not entail significantly altered consciousness. We are decidedly NOT in dualism, because the body is still a mere mental image (just a collectively held one). As I understand your writings, you've opted for a different view, in which there is less functional independence of body, less room between mind and body, in which the latter is merely the image of the former limiting itself. Assuming the above is correct, my question is: Since both views are within idealism, why do you prefer the second to the first? What are its advantages in your eyes? This may be too big of a question to answer in this format, but maybe just one or two points would help me. I think I understand your question fully, and it is a subtle one. It is conceivable that such acquired autonomy also has other forms. After all, the body itself, as an image, may acquire symbolic qualities in the subconscious mind. Any brief study of mythology and symbology shows how true this is when it comes to the symbolic value of e.g. eyes (e.g. the Egyptian eye of Horus), bodies with arms outstretched (e.g. Christian crucifixion), faces, etc. So, once the body image is broadcast, it may become associated with symbolic value and gain an autonomous, archetypal existence in what Jungians call the collective unconscious. We may now ask: what came first, the archetype or the image of the process? Does consciousness localization look like a body because a body is an archetypal image at the basis of how nature is constructed? Or did the archetypal image emerge over the eons from the observation of bodies in the first place? It is difficult to say. But I believe that the _origin_ of the body image is the fact that it is the way consciousness localization _looks_. That image then, _afterwards_, "dressed" a primordial archetype, giving form to it. As Jung always emphasized, an archetype is at first "empty"; it's just a template that is then "filled in" with images from life. I think this is how it happened in the case of the body archetype. Your idea doesn't make a great deal of sense to me. All my research indicates to me that consciousness may have both ‘local’ and ‘non-local’ components. Only a dual approach makes any sense of the data I've seen have from common subjective human experience. Perhaps some type of ‘local’ synchronizing EM field, that correlates with a different, deeper, and more fundamental ‘non-local’ field based mechanism within the brain that we have yet to discover. Wildly speculating, perhaps neurons pump out sensory information into a homogenous 'local' field, that is read back by a deeper 'non-local' system, that is far more powerful - a feedback loop. I'm fine with the studies which you show indicating reduced neural activity, or sudden changes (damage etc.) to the brain might cause an expanded awareness, it's exactly what I see. The 'local' field almost acts like a filter, with external 'like' waveforms amplifying, and external 'unlike' waveforms being totally (or partially) cancelled out. External 'local' fields might be more likely to access the deeper 'non-local' process, when the 'local' field is not functioning as normal. If sensory data, feelings and emotions form shapes and patterns within the 'local' field, these would correlate to the deeper 'non-local' structures within the brain. 'Local' field shapes which are aligned with strangers 'field' shapes (similar visual data, similar emotions, similar feelings), might allow a greater chance of deeper 'non-local' transmission of information. Highly aligned field shapes, with family due to genetic similarity and long term exposure to ways of thinking (or loved ones) might increase the chance of such effects. Indeed the greatest effect might come from our own almost identical field shapes interacting with us from the past, and perhaps the future. So I take – what I suppose – is a middle view, that consciousness ‘is’ created by our brains, but that we must therefore modulate, and in turn be modulated by other external fields. It's difficult to comment since you don't elaborate on why you arrived at this conclusion. >> Perhaps some type of ‘local’ synchronizing EM field, that correlates with a different, deeper, and more fundamental ‘non-local’ field based mechanism within the brain that we have yet to discover. Wildly speculating, perhaps neurons pump out sensory information into a homogenous 'local' field, that is read back by a deeper 'non-local' system, that is far more powerful - a feedback loop. Your argument seem to assume realism, i.e. the existence of a world ('fields') outside subjective experience. This is precisely the point I deny. To me, 'fields' are just a way to model certain patterns and regularities of subjective experience. Thanks again Bernardo, that was great! You have a way to explain complex issues in a very clear, consistent and easy to follow manner. I especially find your whirlpool-metaphor very compelling. It gives a good picture of how complex structures can arise out of a single medium. After all thats all we can perceive - structures in the medium of mind wich we then call feelings, thoughts, and things of the outer world. Yet, these structures dont´t arise randomly. They seem to follow an underlying structure themselves. Perceptions follow each other in a certain mathematically describable way. There seem to be "laws of nature". Where do they come from, why are the the way they are. So to put it in the context of your metaphor: Why and how do whirlpools and ripples form - and ... why is there any water at all. How do you think about that? Thanks for the kind words! I appreciate them, for they give meaning to my efforts. Yes, nature clearly unfolds according to stable, complex patterns and regularities. One can even say these patterns and regularities are not only beautiful, but surprisingly conducive to the emergence of life (whirlpools), as the rationale behind the Strong Anthropic Principle indicates. Your question goes beyond the scope of my talk above. In the talk, all I wanted was to re-interpret the reality we experience every day. Going beyond that gets into speculation territory. But I am not stranger to speculation... ;-) So I personally suspect that the universe is indeed compelled to facilitate the emergence of life and, particularly, of self-reflective life like ourselves, because it's the universe's way to 'look at itself,' so to speak, and make sense of itself. I discuss this much more extensively in the upcoming book. An alternative is to say that the laws of nature are what they are simply because that's the nature of mind. It's what mind is, regardless of any purpose or motivation. Great talk! Everyone is right, you do have a knack for simplicity. I'm a big fan of the argument that decreased brain activity is often correlated with heightened levels of consciousness. Though it is difficult to quantify just what should count as "heightened", so I can imagine not everyone will agree with all your examples. That said, I think it's hard to deny that psilocybin trips should counted as a heightened form of awareness if anything does. And in that case the evidence for suppressed NCCs is compelling--it seems like the study was top-notch. Here's a question: I agree that suppressed levels of brain activity is not what any (honest) materialist would predict during a psilocybin trip. (Obviously inhibitory mechanisms have a role in their models, but none of them would lead you to expect what that study showed.) However, why isn't the opposite correlation a problem for idealism? In other words, why isn't your model in tension with all the other instances in which increased levels of brain activity *do* correlate with heightened levels of consciousness? If the brain is like Huxley's "reducing valve", shouldn't we always expect increases in brain activity to correlate with decreases in our level or degree of consciousness? Basically, I want to know what you think is special about mediation, hallucinogens, NDEs, mediumistic trances, etc that they correlate with lower levels of brain activity, but things like writing this post, playing chess, and driving do not? The latter all seem to require "more" consciousness too. My suspicion is that latter are egoic activities, while the former have a propensity to breakdown or transcend the ego in various ways. This is one kind of expanded awareness. What do you think is different about playing chess that the expansion of awareness it requires does not also suppress brain activity? Well, you already answered your question. :-) Yes, I think the brain is the image of a process by means of which mind localizes itself. But _within_ that process there can be _local_ dynamics of various degrees of complexity. Going back to the whirlpool metaphor: you can have large and turbulent whirlpools, with complex inner dynamics, or small and calm whirlpools, with simple inner dynamics. _Both_ limit and localize the flow of water, but one is internally richer than the other. If we say that the world inside the whirlpool is the world of the intellect -- or the ego -- the bigger and more complex the whirlpool, the more complex will be the intellect/ego's life. But that is in no conflict with the fact that the brain is still the image of a mental localization process, for the same reason that a large and complex whirlpool is still the image of a water localization process. I discuss all this is more detail in my upcoming book. Hello. I saw your video and found it very interesting. But I'm wondering if there's any way to determine if your idea is true. It certainly makes internal sense but is it falsifiable? How can we prove that mind or consciousness is the ultimate reality? And if we're all instances of a single mind, how come we can't telepathically communicate? And what happens to us after we die, under this model? I'm very much interested in nonduality and Buddhism, but I'm having trouble accepting idealism. Yes, I believe my ideas can be compared to experimental evidence, and that they explain _more_ of the evidence than materialism does. As a matter of fact, the first half of my presentation seeks to make precisely this point, when I review some of the latest neuroscience data. I also believe that my interpretation of the data is simple and requires less assumptions than materialism. As such, it is in principle a better explanation for reality, unless it is contradicted by evidence. My claim, again, is that it is _not_ contradicted, but in fact supported by the evidence. In my upcoming book, I review extensive scientific data to substantiate this claim. We can't ordinarily communicate telepathically because we live from the perspective of a localized point-of-view of mind. In other words, we live within a "whirlpool," which limits and localizes the flow of mind that we experience. It is that localization that prevents us from being aware of anything that doesn't penetrate our psychic structure through the sense organs. In my view, death is merely a de-localization of our consciousness. I believe that, when we die, our consciousness expands beyond the ordinary limits of space-time, though we may lose some of our ability for self-reflection. Again, I elaborate on this in the upcoming book. Hi Bernard, I must say I think you are heading in the right direction. I'm looking forward to read your new book, but in the mean time I hope you can release more speeches on youtube etc since I believe that this is a powerful tool to reach the masses, and certainly very entertaining. Thanks! Yes, I'll try to reach out through video as much as I can. Is brain function reduced during sleep? And how do sleep and dreams fit into the view of a reality only existing within consciousness? Are dreams and our perceived reality equally real, or a mental construct within a mental construct? If the first would be true, then is it theoretically possible to alter reality in the same manner as we can do with during lucid dreaming? Generally speaking, lucid dreaming occurs when we obtain the knowledge that we are dreaming. But this knowledge comes only through reference to our experienced perceptions during another mental state (being awake), like experiencing that time moves different during our dream. If this is so, could we theoretically obtain some reference points from some other mental state (perhaps induced) in order to achieve a lucid dreaming effect in a awake state? And btw, great work! I hope more people can adopt your scientific approach to this subject. -- I believe dreams and waking life are identical in essence and in fundamental nature: both are simply manifestations of mind, or "mind in movement." The difference is that, when you are awake, your "dream" is determined by global, collective constraints that ensure we all share a coherent and internally-consistent dream. When you sleep, you are basically "unplugging" from those global, collective constraints and having a personal, idiosyncratic dream. -- I like your assertion that you can only become lucid within a dream because you can reference a prior non-dreaming state. I do think the same can happen in the "dream" of waking life: that's what people often call "enlightenment." "Enlightened" people have accessed a state that transcends the "dream" of waking life. They then come back to life but can always refer back to that transcendent state and know that they are "dreaming." And thanks for your kind words! Bernardo I was sent a link to your video by a friend and I have to say, your ideas are mind blowing. I'm going to reserve judgement until I read the book as it to easy it to get overly caught up in the metaphors you use in this short presentation. I think what you are saying is that postulating an objective reality that exists separately from our subjective experience (i.e. materialism, common sense) adds a layer of meta-physical complexity that is not needed to explain the fact that our current reality is shared consistently (at least among standard issue brains) among all of us. Instead there is simply is Mind. Existence is Mind. We are localized and therefore by definition, limited foci of Mind (very tempting to use the word God here). We live and accumulate experience based on the particular pattern of limitations that define how we coalesce into localizations. Hence there could be any number of different consistent subjective "realities" (universes) embedded in Mind. I think I'm missing something because if I'm describing your theory correctly then you could simply call yourself a New Materialist and say that Mind is the true objective reality underlying all our subjective experiences including scientific observations. I hope you get a chance to comment on this. Interestingly this reality would make un mysterious the collapse of the wave function problem, ESP, and a bunch of other stuff while accommodating, I think, everything else that materialism does. To me the simple fact that you have described a meta-physical reality that is conceptually simpler and may better fit empirical observation than materialism is striking and useful even if you are wrong. As you know many materialists won't even admit that Materialism is meta-physics. One can't help but wonder if the current madness, post quantum mechanical theoretical physics has descended into, would still be, if yours was the intuited world view. If you still need readers, I would love to, otherwise I look forward to the book when it comes out. Your summary of the ideas I presented is accurate and pretty clear. In a sense, you did a better job than me. I would strongly resist, though, calling myself a "New Materialist." The essence of materialism is the idea that reality (matter, energy, space-time) is outside mind, and that mind somehow emerges from that non-mental reality. My point is precisely to deny both of these postulates, so in a strong sense I promote the antithesis of materialism. I do understand, though, your motivation to say this. After all, materialism has become so inculcated into our minds that it has acquired a kind of natural plausibility resistant to critical analysis. So when a new idea is proposed that seems instantly plausible, we feel tempted to call it a new form of "materialism." That, in itself, bears witness to the power of the hypnotic materialist trance we live in! PS: Many thanks for the kind words you shared regarding my work. Most people underestimate how important this sort of feedback is for authors... It keeps us going. Bernardo, I want to thank you heartily for this video and for all of your careful, inspiring thinking. I am a philosopher by training. I received my Ph.D. in philosophy from New York University in 2008, and my dissertation was a defense of an original theory of realist metaethics that argues that our conscious experiences of pleasure and pain (loosely defined to include a wide range of valenced emotions) are what give us our basic understandings of ethical concepts like good and bad and, as a consequence, make it the case that good and bad are not simply useful social constructs (as so many materialists like to argue) but actually refer to positive and negative qualities in our experience. While it won the dean’s dissertation award, it was a dissertation that very few people truly understood and even fewer agreed with, but it was a result of my strong personal conviction that consciousness is ontologically (and epistemologically) primary. I am, like you, an idealist, and I have defended idealism often against my colleagues, but I've never felt I had the scientific background necessary to produce a compelling written defense of the view. So I’ve restricted my academic work to ethics. But I have to say that I think you've produced the work that I would have liked to be able to! It's exciting and invigorating to come across another person with such similar ideas but who has the resources and clarity of mind to develop them beyond my own current stage of thought. I found myself nodding and smiling at many points during your presentation, where you so beautifully crystallized thoughts to which I’ve been trying to give definite form for years. Many thanks. Wow, thanks! It's really nice to see a philosopher enjoying my musings. And your thesis sounds quite interesting. Is it available online? The book is already in the warehouses and should start shipping soon. It should be delivered actually before the official release date. I would be very interested in knowing what you think of it after you've read it. Implanted memories... or are they?